SHOGUN Fertlisers was born out of a desire to create something special, something new for the hydroponics market. Not just another basic set of feeds, but something truly exceptional born out of years of research, development and commercial application. 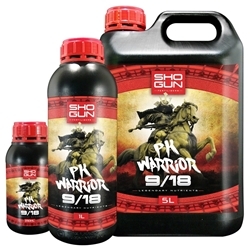 Shogun is a UK company with a wealth of experience of what growers really want from their nutrients and additives and have created a range of products that combines exceptional performance with great value dilution rates. 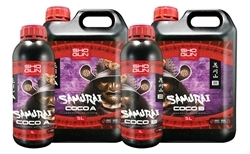 Samurai Coco A&B is a complete coco nutrient feed to rival all others. With precision ingredients blended meticulously to a strict code of perfection, Shogun Fertilisers Coco Nutrient is a much needed breath of fresh air to any indoor gardener ready to experience something new, without having to worry about compromising on quality as Shogun Samurai Coco has finally arrived to further increase the fantastic results already being experienced with the Shogun additives. Shogun Fertilisers are proud to introduce two unique features; SmartZen Maximiser and AquaZen slow water formulations - both bringing the latest in cutting edge plant technology to further impose the superiority of Samurai over all other currently available fertilisers. 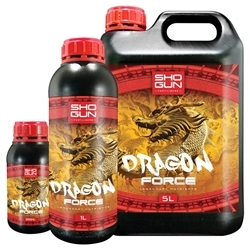 Shogun Dragon Force is an explosive late flowering booster designed to deliver a massive boost to your plants in the final stages of the flowering cycle. 1x Samurai Coco 1 Litre A and B, 1x 250ml Katana Roots, 1x 250ml Silicon, 1x 250ml CalMag, 1x 250ml PK Warrior 9/18, 1x 250ml Sumo Active Boost, 1x 250ml Dragon Force and a Shogun Coco Grow Chart. 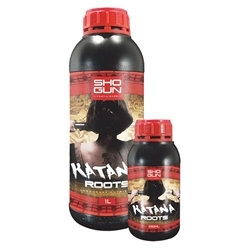 Gives your roots the cutting edge required for explosive growth, SHOGUN Katana Roots stimulates ginormous root growth and a strong healthy root zone. All great plants need a strong foundation and the expertly formulated combination of ingredients in Katana Roots help to create the most efficient nutrient uptake mechanism your plants could ever need resulting in massively increased performance and ultimately better yields.